Home » Pengajaran » Rangkuman » What is Communicative Language Teaching? 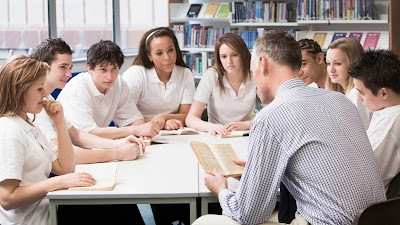 The origins of Communicative Language Teaching (henceforth CLT) can be traced back to the late 1960s and early 1970s, when several influential applied linguists, writing in journals and speaking at conferences, argued that language learners, despite their often rigorous study of language as a system (essentially grammar and vocabulary) and extensive practice in language structures (through e.g. audio-lingual language teaching), were unable to use language effectively in real-world communicative situations. Since this time, a central aspect of CLT has been how to understand the concept of communication and how it should inform language teaching. For this reason, the present chapter explores how CLT might be understood when considering communication from a number of different perspectives. While communication is arguably universal, what forms of communication we engage in, how we understand communication, how it is affected by changes in technology and society, and how it is intertwined with context and cultures is more complex. Here we will approach this complexity from three perspectives: communication as competence (generally regarded as the aim of CLT), communication as process (sometimes used to inform communicative methodology) and communication in context (addressing concerns about the ‘Western’ origins of CLT). Exploring CLT in this way is not meant to generate specific advice about communicative teaching techniques, or in any other way ‘tell’ teachers what or what not to do in the classroom. Rather, by exploring communication from these different perspectives, the chapter hopes to promote teachers’ own reflection on whether and how CLT may be appropriate in their own particular practice. Describing communication as the goal of language teaching has, since the early 1970s, involved the development of increasingly refined definitions of communicative competence. Hence, understanding communicative competence is one way of understanding CLT. Prior to the 1970s, the dominant view of language was structural, that is, language as consisting of discrete items (vocabulary) and rules (grammar). In the 1970s, a confluence of factors allowed applied linguistics to coalesce on a new view of language as communicative competence. Notable influences included Halliday’s (1973) work on the semantic potential of language, Hymes’ (1972) exploration of the relationship between language as a system and communication in social situations, and Wilkins’ (1976) development of the analytical notional/functional syllabus. Another important factor was the development of (British) applied linguistics as a field generating ideas distinct from earlier structural and Chomskian theories. One challenge to the usefulness of any definition of communicative competence is that it attempts to represent ‘in a few abstract constructs the complex realities of language use across an unforeseeable range of variation and situational contingency’ (Lee 2006: 351). The range of variability extends not only to the real-time unfolding of situations, but also to variation in patterns of communication across and within both small cultures (cohesive groups of people in particular societal settings) and large national cultures. Another challenge to the definitions of communicative competence is that they are usually formulated to represent communicative competence as something quite fixed. This means that the aim of language teaching is fixed as well (because communicative competence is the aim of language teaching). In reality, societies and technologies constantly change, and ways of communicating therefore keep changing. Hence, the aim of language teaching is something that may constantly change. Finally, communicative competence, whether the standard definition or a more recent one, is not a recipe for what should happen in classrooms. It may be possible to argue that a de-contextualized focus on grammar and vocabulary is unlikely to result in learners developing sociolinguistic, discourse, strategic and/or intercultural communicative competence. However, focusing exclusively on language use in context, without any focus on grammar, has more recently also been challenged (cf. Swain 1995). A more cautious interpretation, then, is that because communicative competence includes grammatical, sociolinguistic, discourse and strategic (and if you like intercultural, computer-mediated and other) competence, language teaching should focus on all of these things. However, definitions of communicative competence do not help us decide how to focus on these things in actual classroom activity. As a perspective informing CLT, communicative competence may give us a sense of ‘where’ we are going; it does not tell us ‘how’ we get there. To understand CLT methodology, or what should be happening in classrooms, the CLT literature has, more or less overtly, turned to models of the communication process. The implicitly held position is that you learn to use language through communicating. Hence, understanding what is involved in the process of communication is a second way of understanding CLT. This analogy emphasizes the co-active nature of communication; it is something we do with people, not to people (ibid.). With a co-active view of the communication process, new and different ways of thinking about language teaching present themselves. For example, when both or all participants contribute to the success of the communication process it becomes less appropriate to speak of productive and receptive language skills. We have seen the emergence of several terms in the language teaching literature to describe this potentially co-active nature of classroom communication, including negotiation of meaning (Long 1983) and collaborative dialogue (Swain 1997). Finally, it is important to point out the limitations of understanding language teaching in terms of communication as process. Most importantly, models of the communication process are not theories of either pedagogy or learning. Recent dynamical explanations of the language learning process lend theoretical support to the position you learn language by using it (in communication). However, this ignores empirical evidence showing that to develop particular aspects of communicative competence, pedagogic ‘manipulation’ of communicative activities may be needed. For example, communicative tasks need to encourage focus on form (not just meaning) in order to develop acceptable levels of grammatical competence (Swain 1995). In sum, although there are several apparent correspondences between communication processes and language teaching, there is also some empirical evidence that challenges the extent to which communication as process can inform language teaching. There has been widespread uptake of CLT in language teaching worldwide. McKay criticizes this spread of CLT because its emphasis on ‘democracy, individuality, creativity and social expression’ (McKay 2002: 120–121) fails to respond to local teachers and students’ needs and backgrounds. An alternative view is made possible by taking the starting point of this chapter seriously. That is, ‘communication is universal; how we understand communication, how it is affected by changes in technology and society, and how it is intertwined with context and cultures, is more complex’. According to this more critical view, rejecting CLT for certain parts of the world because prevailing descriptions of communication are ‘Western’ would be to ‘throw out the baby with the bathwater’. Rather, actual communication is a situational and cultural dynamic that cannot be ignored in any context. This view, then, constitutes an opportunity for, or a call to, language teaching professionals worldwide to explore what communication may or can be to them, in their own language teaching situations, and in their own small or large cultural contexts. The fact that CLT has ‘Western’ origins certainly adds to this challenge. However, we should be careful not to dismiss the capacity of language teaching professionals in all parts of the world to approach both communication and CLT in a critical manner. What kind of communicative competence do my students need? What communicative processes might my students meaningfully engage in? Do my answers to the first two questions make sense when considering communication in the real world around us? Responding to these questions would hopefully help determine the appropriateness, possible shape, as well as the limitations of CLT in context. Hunsto, Susan, and David Oakey. (2010). Introducing Applied Linguistics: Concepts and Skills. USA and Canada: Roudledge. 0 Response to "What is Communicative Language Teaching?"